How to Convert RAW Images to JPEG Files? Do It With Ease in PhotoWorks! How to Convert RAW Photos to JPEG Files Without Losing Quality? If you are into photography, you’ve probably heard about using RAW files for photo shoots instead of JPEGs. 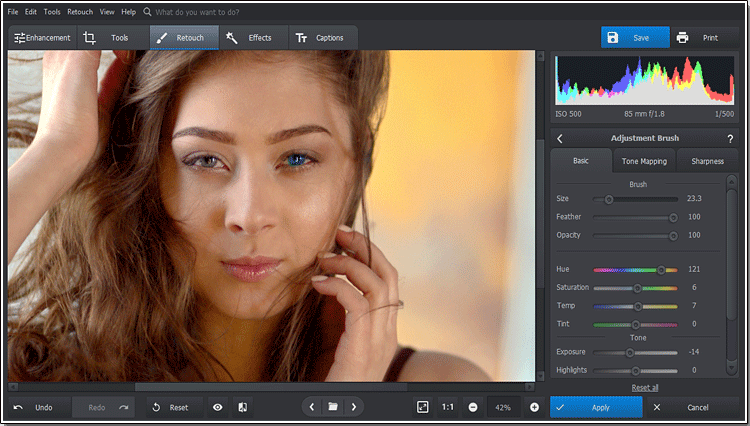 This format is considered to offer more opportunities for retouching and editing images. However, there is a small problem - you will need special software or a RAW-to-JPEG converter to open it. Not to mention editing or saving such images in other formats. How to convert RAW to JPEG then? There are many ways to do that. In this article, we will show you the easiest way that will be suitable for both photography novices and pros. Using this method, you will be able to change RAW into other image formats easily, without Photoshop or Lightroom. Curious? Read on to learn how to convert RAW with PhotoWorks. What’s the best choice? Why use RAW when you can shoot in JPEG and not have to mess with the conversion at all? Yes, working with JPEG is easier: just take a shot, open it with any editor and voila - it’s done. 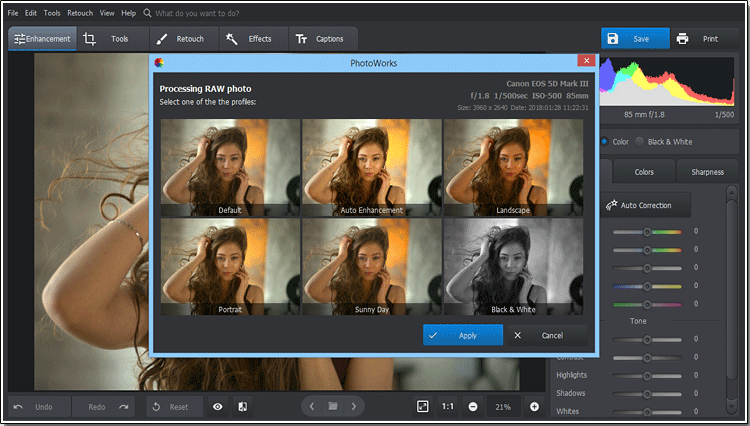 However, the RAW format opens a whole new world of image editing for you. “Raw” means “unedited”, so the settings of your camera like ISO, color balance, exposition and others will not be applied to this shot. You’ll get exactly the same picture as you have in front of your eyes. Keep in mind though that each camera has its own type of RAW: .CRW, .CR2 for Canon, .NEF, .NRW for Nikon, .ARW, .SRF, .SR2 for Sony and others. So make sure that the software you choose will not only work on your PC but will open your device format. JPEG, on the contrary, takes the camera settings in. If your device has wrong settings for the current scene, your pictures may turn out too dark, too bright or too warm after editing. These flaws will be rather difficult to fix because of the camera settings packed into the JPEG format. That’s why shooting in JPEG may be quicker, but you must be 100% sure that your device won’t mess the pics up. If you want to start working with RAW and changing it into JPEG, be sure to check out how to edit RAW images correctly as well. It will help you get the best results during the conversion and retouch. Now, let’s go back to converting RAW to JPEG. 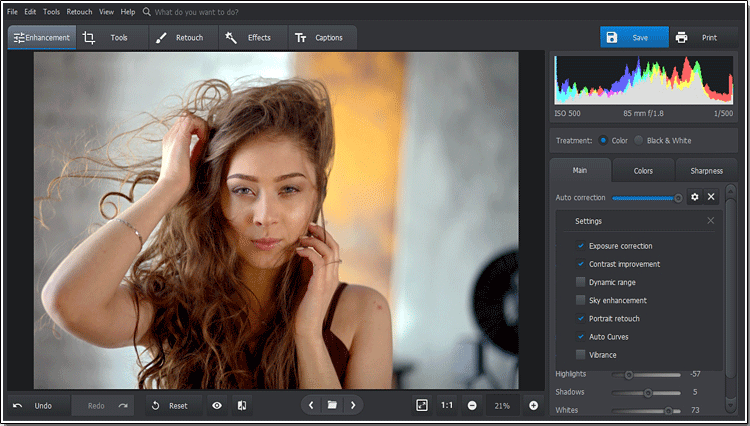 The easiest way is to get a powerful image editor, like PhotoWorks. This software runs on Windows XP, Vista, 7, 8 and 10, and opens different RAW formats with ease. Start the software and open your RAW image. Choose one of the editing modes that suits your needs: Standard, Portrait, Landscape, Automatic or some other. It will turn a dull RAW into a good-looking shot and help you find a vector for the further retouch. 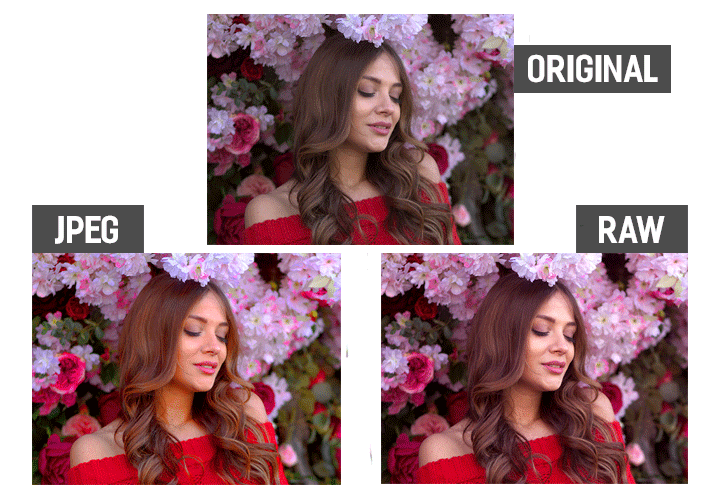 Now you can start working magic on your photo. 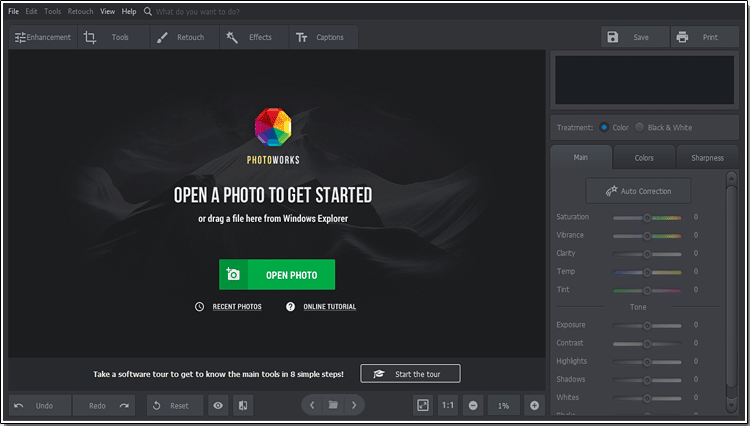 PhotoWorks is not just a simple picture editor but a powerful image enhancer that lets you make your RAW pictures perfect in a click. For example, the smart auto correction will find all the flaws like overexposure, lack of contrast, incorrect ISO balance and fix them right away. Done with enhancing? How about experimenting then? Apply vignettes, play with one-click effects or change colors on your photo altogether. Want to experiment with the looks? Try out easy eye color changer, dye hair, apply make-up and change your style in a minute. To finish the conversion, save your photo as JPEG. If you need, you can save it in other image formats as well. Now you know how you can quickly change RAW into JPEG. Put this knowledge into use with PhotoWorks and create stunning images in a few minutes. Get Perfect Photos Right Now!